I still have some pineapple left in my freezer from my fruit tart. I need to use up before it turns bad so I decided to make a pineapple upside down cake. The last time I bake this was probably in my high school. That was one of the cake we learned back then. I remember I was so excited about it because it was so beautiful with the round pineapple and cherries on the top. I wonder why I never bake this again after that. 1. Pre-heat to over to 350 degree F. Grease an 8" round cake pan. Prepare the topping by melting the butter in the microwave oven and pour it into the baking pan. 2. Srinkle the brown sugar on top of the butter and then arrange the pineapple slices over the brown sugar. Place the cherry in the center of each pineapple slice. Set aside. 3. Sift together flour, baking powder and salt. Set aside. 4. Cream the butter with the sugar until the mixture is light and fluffy. Add the eggs, one at a time, beating well after each addition. Stir in the vanilla. 5. Add the flour mixture in three parts alternately with the pineapple juice, beginning and ending with the flour mixture. Beat well after each addition. Spread the batter evenly into the prepared pan. 6. Bake cake for 45 to 55 minutes, or until a tester comes out clean. Let the cake cool in the pan on a rack for 15 minutes. Run a thin knife around the edge, and invert the cake onto a plate. Serve the cake warm or at room temperature. Well, i actually created a website for baking cause of my school requirement-- just a course -- to do some web authoring-- so i taught of creating about cakes etc.. i would like to ask do you mind if i use some of ur recipe? i will mention it is by wan. I taught of sending you a personal email-- but than i can't find ur email ya.. so here i leave a comment .. the web will not appear under google serch site because the domain is registered under education-- so it will just be there for 1 year and it will be down-- can i?? honestly i used one of your agar-agar recipe-- so if you don't allow i will than bring it down -- by the way-- i like your site-- :) always visit here at least once a week.. thanks for all ur recipe!! Gert, Murphy dah ban I from baking this delicious pineapple upside down cake since I bake it poorly last time. But I will keep trying baking this when I have time.your recipe looks easy. Vaness, of course you can use the recipe here as long as you link the recipe back my blog or give credit to the recipe owner. By the way my e.mail address is at my profile. Zue, this cake is easy and taste really good too. Why don't you bake this cake and surprise Murphy with it. Yum. I made this before with just canned pineapple, wow it is so light and sweet and delicious. I will try adding the cherries next time, seems like a nice addition of flavor and color. Gert your pineapple upside down look good! !.Love pineapple! !I remember the first time I baked your apple upside down recipe it's a failure and until now I never bake that cake again..Maybe I should bake any fruit upside cake again since it's fruit season now!! I love that brown crust. Mmmm. This is simply womderful. I've been craving pineapple for some time now. As always, I'm impressed by your baking skills! Very good looking cake. I'll probably try making it this weekend and let you know how it turns out. Gert,hop over my kitchen,I have something for you!! Gert, you always impressed me with your baking & cooking skills...and yes agree with cat, hari2 tengok your blog, air liuh melilih. Made it tonight for my son's b/day...fantastic! Gert, i never made this b4..nnti boleh try..looks nice n i bet d taste pon sure sedap..
Looks great Gert...I want to eat one again. I'll try your recipe next time. Lesley, since now you are really good at baking you should give the cake a try again. Dawn, pineapple and cake goes really well. Cat, LOL..nanti I buat you one but let me know when you are not on a diet ok.
Jen, you are most welcome. Lesley, thanks for the award. Anon, glad you like it and happy birthday to your son! Rita, what you did wrong? VG, I too will try your recipe the next time :) :) Have a good trip o.k. Ah? I did not see the note...is it ion the banana pancake comments? 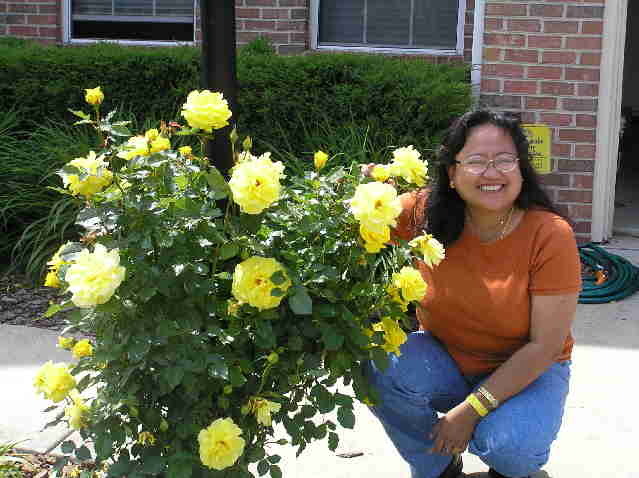 Hi Gert, just visited ur blog. Nice to see all ur wonderful recipes. Sweetbites, thanks for stopping by. I came into your blog while browsing Zue's blog. Both blogs with so many delicious food are really amazing. its such a lovely cake.. i remembered baking this back in secondary school during the home economics class. very popular cake..its been ages & have touch with the recipe & finally i found it here.. However the measurement which in cups are pretty confusing for me. it would be nice if you are to convert for me/other bloggers for easy reference. Hello. I am interested in baking your cake tomorrow. Yours was one of few that I found that had a slice to view what the crumb would look like as the end result, and wasn't from a pre-made mix. I am new to baking and noticed that your recipe calls for the use of pineapple juice as a liquid instead of milk. Is this correct? Or should there be milk added to the recipe? It was my intention to e.mail you with this query, however it seems the link to your e.mail address on your profile is disabled in some fashion. Phosphorus, yes I used the pineapple juice instead of milk. If you click on my profile page you will see my contact email there. Hi there, good day to you. I have attempted in baking the cake ytday and I am really pleased with the outcome.